In Total Freedom, Chris Matthew Sciabarra is on a mission to rescue “dialectics” from the Marxists and bring it to libertarianism. He sees libertarianism as a movement for individual freedom that includes the myriad schools of classical liberalism, including Ayn Rand’s Objectivist system. Part One, as the title suggests, is a treatment of Sciabarra’s project for dialectics—it is as he asserts in his Introduction, an attempt to wrestle “dialectics from its exclusive contemporary association with the left.” In today’s intellectual environment, the term “dialectical” is suggestive of leftist philosophical ideas and movements. To speak of something like “dialectical libertarianism” is a heresy not only for the classical liberals but also for the Marxists. 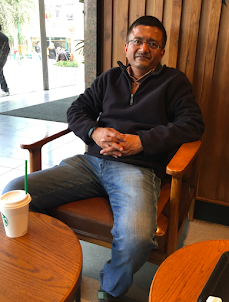 Part Two is about the concrete implementation of dialectics in the libertarian movement. But as the focus in this section is on Murray Rothbard, the central philosopher of anarcho-capitalism, our first impression is that Sciabarra is endorsing Rothbard’s anarchist ideas. But as you read-on you find that Sciabarra is, in fact, offering a robust criticism of Rothbard. He makes the case that the anarcho-capitalists are guilty of misusing dialectics in the same way as the Marxists. The book has an extensive discussion of Ayn Rand’s ideas, and Sciabarra’s project of “dialectical libertarianism” often seems like an exegesis of “dialectical Objectivism.” Sciabarra says that the term “dialectical libertarianism” is important because “in this integration, dialectics is rescued from those who view it as a totalitarian tool, just as libertarianism is rescued from those who view it as an extension of their fragmented, atomized view of reality.” Also, in this integration we have dialectics getting inextricably connected to the notion of freedom, and libertarianism being connected to the notion of totality. The credit for bringing dialectics to leftist politics goes to Marx who used the concept of “dialectical materialism” as a tool for analysis of society. In Part One, Sciabarra begins by proposing that Marx has made an illegitimate use of dialectics and that the Marxist concept of “dialectical materialism” is nondialectical. He holds that when libertarian thinkers rejected “dialectics” along with “dialectical materialism,” they made the proverbial mistake of throwing out the baby along with the bathwater. But he points out that Ayn Rand has never repudiated the dialectical methodology, even though she did not describe her philosophical method as being dialectical. In his earlier book Ayn Rand: The Russian Radical, Sciabarra has identified Rand as the key theorist in the evolution of the “dialectical libertarian” political project. He identifies the Aristotelian background of dialectics while trying to project Rand as an Aristotelian and radical thinker. The first chapter of Total Freedom, “Aristotle: The Fountainhead,” has the title of Rand’s famous novel alongside Aristotle. And Sciabarra reflects on the irony of it that it was Hegel who has described Aristotle as “the fountainhead” of dialectical inquiry. Sciabarra begins his exegesis by tracing the roots of the concept of dialectics to ancient Greek philosophers predating Plato. He points out that while Plato is often regarded as the founder of dialectics, it is Aristotle who cleared the web of Platonic illusions and created a complete picture of what it means to be dialectical. 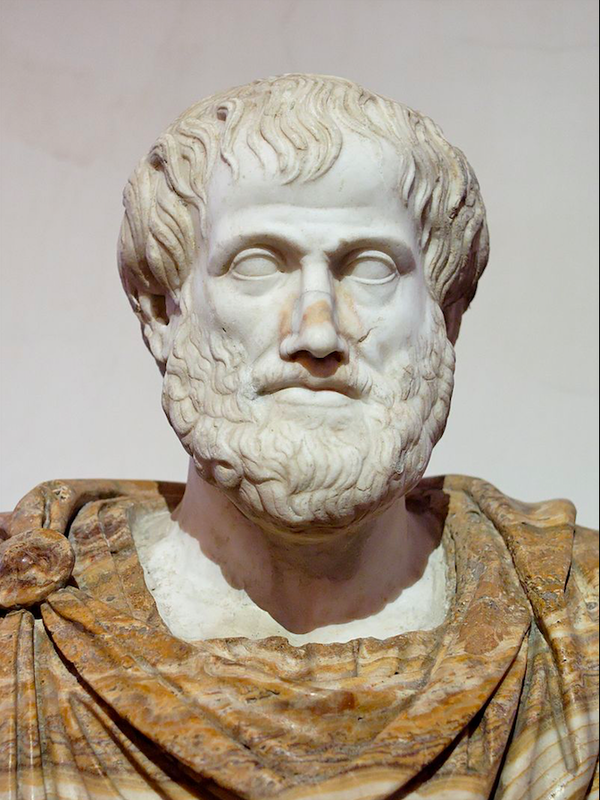 Aristotle’s Topics, and its companion, Sophistical Refutations, are the definitive ancient texts on dialectics. The next philosopher to do major work in dialectics is Hegel. Sciabarra sheds light on the interesting facets of Hegel’s dialectical thinking, including the dialectical syllogism which is Hegel’s means for delving into “the assumptions, premises, and inner complexities of thought, and by extension, of existence.” These syllogisms are the myriad relations between Universals (U), Particulars (P), and Individuals (I)—and Hegel proposes three basic forms: I-P-U, P-I-U, and I-U-P.
As I have said earlier in the article, Part Two is focused on Murray Rothbard, but there is also reflection on the ideas of other libertarian thinkers, including Robert Nozick, Douglas Den Uyl, Douglas Rasmussen, Charles Murray, and Tibor Machan. 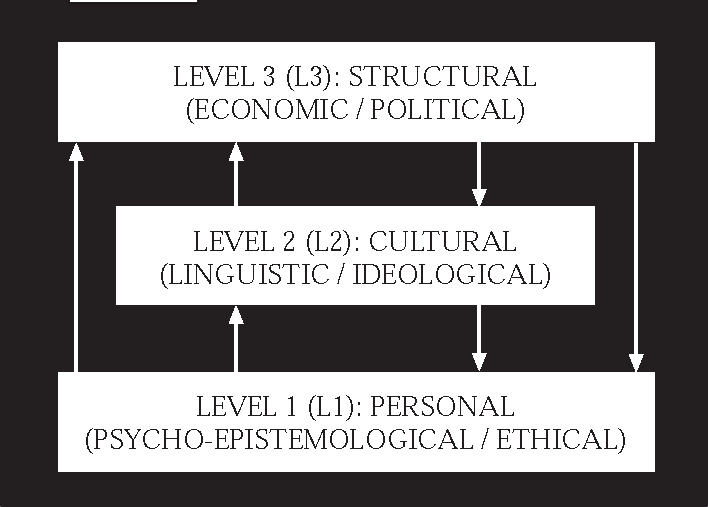 According to Sciabarra, the problems that plague Rothbard’s system “are rooted in the very foundations of his social ontology.” Even though Rothbard has posited a nonatomistic view of human nature, “he forges a dualistic separation between personal morality and political ethics, cultural specificity and libertarian ethos, abstract normative political principles and historical context, voluntarism and coercion, and finally, market and state.” Sciabarra’s commentary leads you to draw the inference that Rothbard embraced paleo-conservatism in the later part of his life because of his dualistic view of the central aspects of human life and society. Rothbard sees the state as an inherently parasitic institution which, by its every nature, must always be at odds with the individual. He viewed history as a contest between the voluntarist principles of the market and the hegemonic principles of the state. There is a commonality between his views and that of the Marxists in the sense that both regard the state as being disruptive and regressive, but the political implication of their ideas is vastly different. Because Rothbard integrates the tools of Austrian economics with anarchist class categories, he reaches a view of political society whose leitmotif is absolute freedom for the citizens. Rothbard picks up the Marxist idea of “anarchy of production” and universalizes the concept to develop his ideas of full-fledged anarchism. Rothbard rejects Nozick’s idea of a minimal state on the ground that a minimal state, with monopoly on the coercive use of force, will not stay limited. Sciabarra arrives at the conclusion that because of his lack of attention to the vast context within which all principles of social organization must exist, evolve, and thrive, “Rothbard stands on the precipice of utopia.” Nevertheless Sciabarra does note those parts of Rothbard’s work that exhibit dialectical elements, and finds these to be among the effective, and radical, aspects of Rothbard’s worldview. 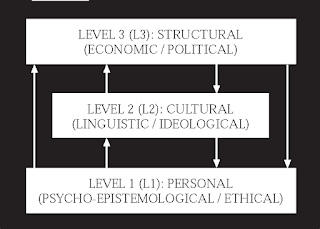 In the post-Aristotelian period dialectics has served as the plaything for the philosophers of irrational and collectivist ideas. 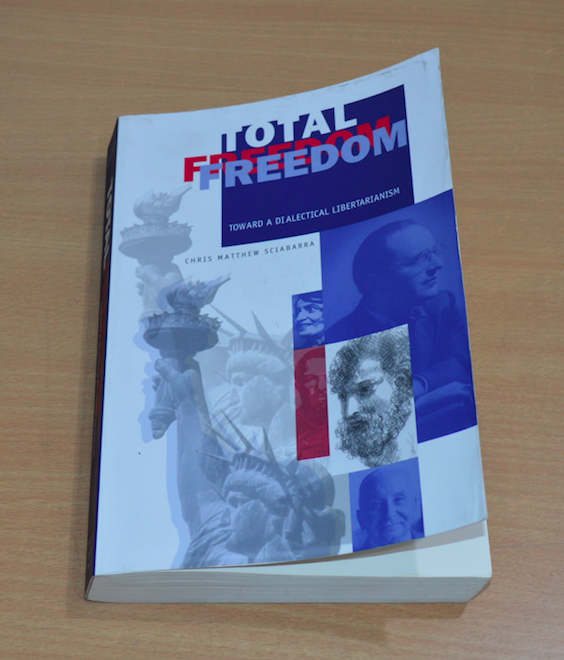 Total Freedom is an attempt to change the perception of dialectics. Overall, the book has several interesting ideas to show that dialectics has the potential to enrich our understanding of facts and principles.